Photo: David Taylor (USA) gets his hand raised in victory after pinning Olympic champion Hassan Yazdanicharati (IRI) at the 2017 Freestyle World Cup. Photo by Justin Hoch, JHoch.com. Competing at his first Freestyle World Cup, Taylor put the international wrestling world on notice by posting arguably the best performance by an American in the history of the prestigious event. Taylor was part of a loaded U.S. team that featured Olympic champions Jordan Burroughs and Kyle Snyder, World champion Logan Stieber and World medalist James Green. With all the star power in play, only Taylor and Burroughs finished the World Cup with undefeated marks. Wrestling all four matches for the U.S. at 86 kg/189 lbs. in the international dual meet competition, Taylor went 4-0 by defeating two Olympic champions, an Olympic bronze medalist and a Junior World champion over a two-day span. His first match against 2012 Olympic bronze medalist Dato Marsagishvili of Georgia was in fact his most competitive. Taylor trailed 3-0 early on before his relentless pace took over the bout. Three takedowns, including a four-point single leg, pushed Taylor to the win, 8-3. In the second U.S. dual meet Taylor helped lead the Americans to a win over international power Russia with a 14-4 technical fall over 2013 Junior World champion Vladislav Valiev. Again, Taylor trailed early, this time by four points. He stormed back with six takedowns and a turn to ice the match. The competition got even tougher on the second day of the Freestyle World Cup with two Olympic champions standing opposite Taylor in the U.S. duals against Azerbaijan and Iran. Taylor controlled every aspect of his bout against 2012 Olympic champion and 2016 Olympic bronze medalist Sharif Sharifov of Azerbaijan. He notched five takedowns and a match-ending exposure from a near-side cradle position to cement a 12-2 technical fall win. In the championship match against Iran, Taylor took the mat against reigning 74 kg/163 lbs. Olympic champion Hassan Yazdanicharati with the outcome of the dual squarely on his shoulders. A win kept the U.S. championship hopes alive moving forward and a loss clinched the dual for Iran. Taylor gave up three step outs to start the bout before his pace and pressure took over. Taylor finished his World Cup with four-straight takedowns on Yazdanicharati, the last of which led to a pin at the 5:05 mark of the match. The U.S. fell one match short of defeating Iran and winning the Freestyle World Cup for the first time since 2003. 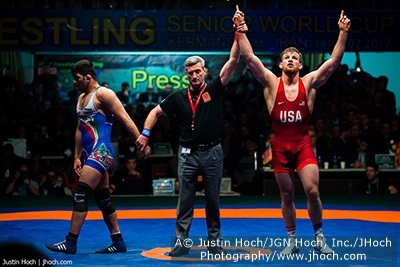 Even in the second-place effort, there is no doubt Taylor was the outstanding wrestler of the event that was held in Kermanshah, Iran. Prior to last weekend, Taylor won gold medals at four international events with his most recent coming at the 2017 Paris International. He finished in third place at the U.S. Olympic Team Trials in 2016. Taylor was a two-time NCAA champion, four-time NCAA finalist, two-time Hodge Trophy winner and four-time Big Ten champion for Penn State from 2010 to 2014. He also helped Penn State capture four-straight NCAA championships as a team during his tenure in State College, Pa.
Each week USA Wrestling will select an Athlete of the Week based upon performance within wrestling for that week. The selection committee will consider any level of wrestling from youth programs through the senior level. To nominate a wrestler for this honor please send the athlete’s name, wrestling program and weekly and career accomplishments to Richard Immel at rimmel@usawrestling.org.